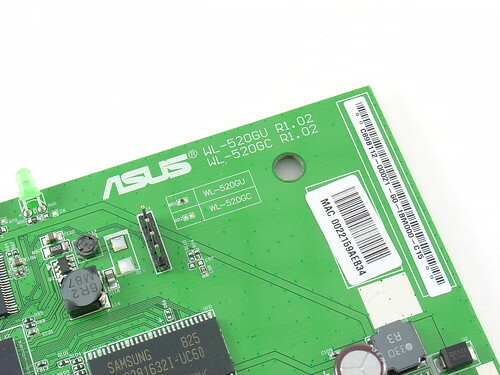 In my previous post about the Wifi Radio project I’m working on, I concluded that the Asus WL-520GU wireless router was the perfect choice for an embedded wireless platform, thanks to its builtin 802.11g WiFi, Linux support, and extremely low cost . (In fact, the price after rebate has dropped since my last post – now would probably be a good time to buy one if you’re thinking about hacking it into something eventually). Here are the specs on this router, based on an inspection of the hardware and the stock firmware Linux kernel boot log (the complete log is here). 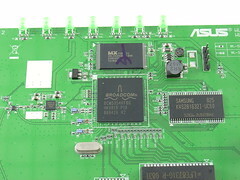 Here are some images of the PCB, click for a larger version. 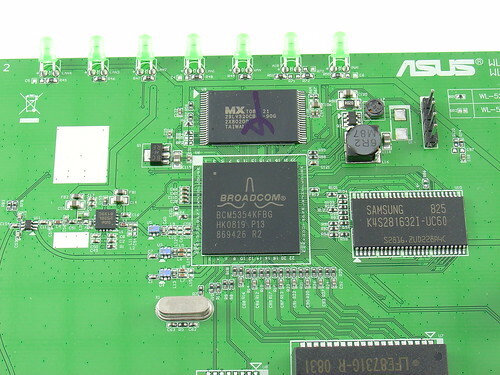 Here’s a closeup of the Broadcom BCM5354 SoC – the brains of the router. 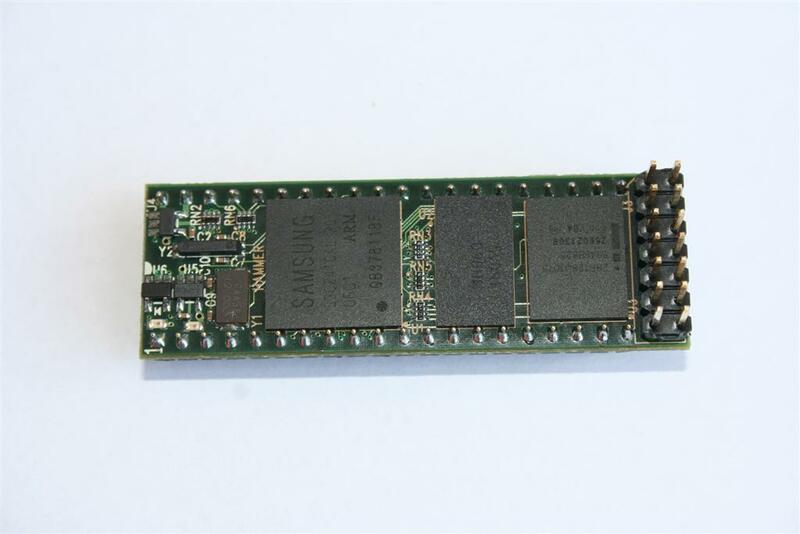 It is surrounded by a 4MB MX flash chip above and a Samsung 4MB SRAM chip on the right. Overall this is a great little router and an even better platform to build an embedded Linux system, provided you don’t need USB 2.0 support. If you do, look at the WL-500gP v2 instead, it has two working USB 2.0 ports (in addition to much more flash storage and RAM). 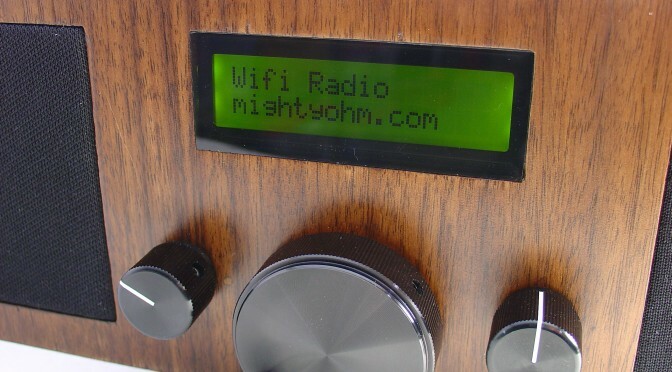 This is the second part of an ongoing series about building a low cost, open source streaming internet radio. if you haven’t already, check out part one for some background about the project. In part one, I discussed the merits of streaming internet radio and the motivations for my Wifi Radio project. Now it’s time to start looking at what hardware can make this project a reality. Before we get started, let’s review the requirements list from last time. Cheap, priced below a commercial streaming radio – target < $100. How do these requirements translate into hardware? Let’s take a stab at what features we’d like in an embedded platform. 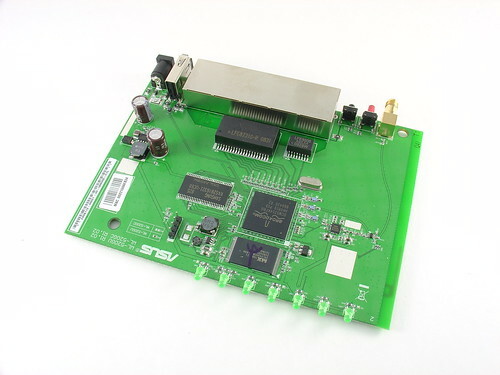 The size and cost aspects pushed me towards an embedded system instead of a small form factor PC like any of Shuttle’s XPC offerings or a nano-ITX board. To me, “Ease of development” equals Linux, so I wanted something well supported by Linux and an active open source development community. 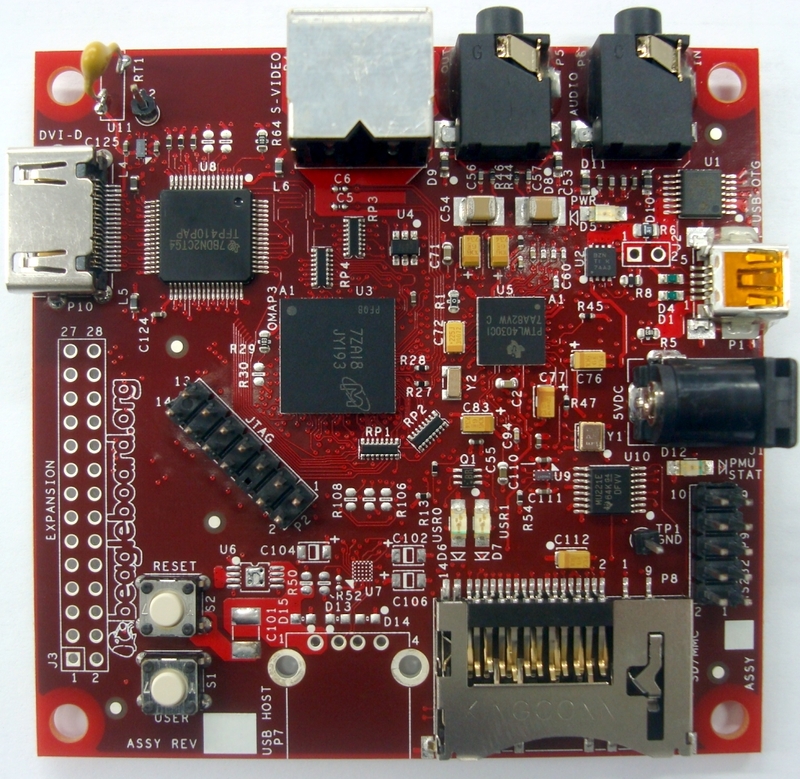 The Tin Can Tools Hammer – very impressive ARM9-based board with USB, lots of RAM and flash, lots of IO, and best of all the footprint of a 40-pin DIP package (breadboard compatible!). No wireless and relatively steep pricetag ($160). 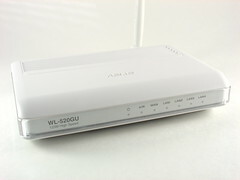 Consumer wireless routers like the Asus WL-500gP v2 and WL-520GU – builtin wireless (yay! 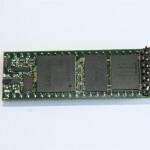 ), USB, 240MHz Broadcom 5354 core, decent RAM and flash, cheap. Newegg has the WL-520GU for an incredible $26 after rebate (normally $50). The higher end WL-500g has more memory and flash and an integrated USB 2.0 hub (2 external ports). Newegg has the WL-500g Premium V2 for $50 after rebate (normally $80). Both versions are a steal for what you get. Tiny, under $50 and with built-in wireless, the Asus WL-520GU is the clear winner for this project. The downside? Since this router was never intended to do anything other than, well, route, we’re going to have to crack it open, modify it, and void the warranty. In addition, there is no tech support and we’re going to have to spend some extra time hacking around to get it to do what we want. 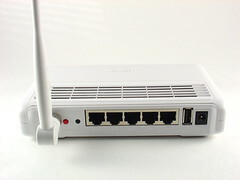 This router is supported by OpenWRT, an open source Linux distribution for small embedded devices. Ignore the work-in-progress designation, it works, trust me! 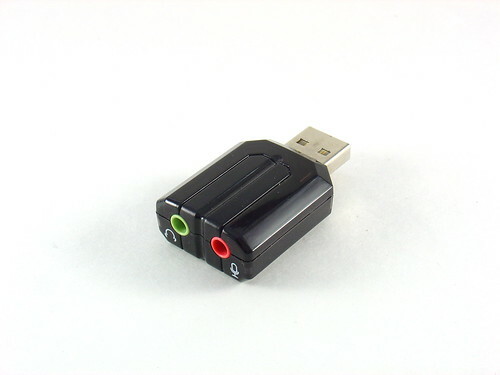 Although the router lacks builtin audio, that is easily solved with an $8 SYBA SD-CM-UAUD USB Stereo Audio Adapter . There have been reports that the WL-520GU only supports USB 1.1 reliably, but USB audio doesn’t require USB 2.0 so it’s not an issue for us. 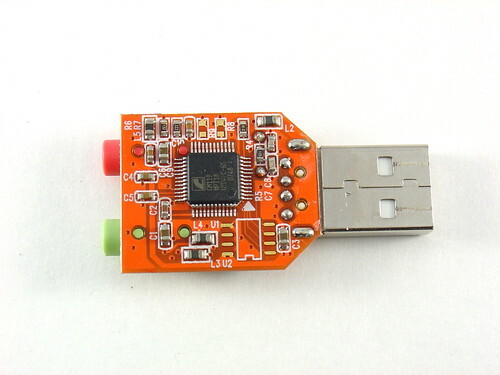 For full USB 2.0 support, look at the WL-500gP v2 instead. So far we have $58 into the project ($38 if you are lucky enough to get the rebate) and we have an embedded Linux computer, a wireless interface, and an audio output. Not bad! That’s it for part two! 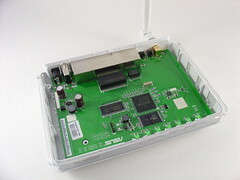 In part three I’ll install a serial port on the router and get ready to reflash the stock firmware with OpenWrt. At that point we’ll be able to start listening to some tunes! Update: I posted detailed specs for the WL-520GU and a couple more photos here. 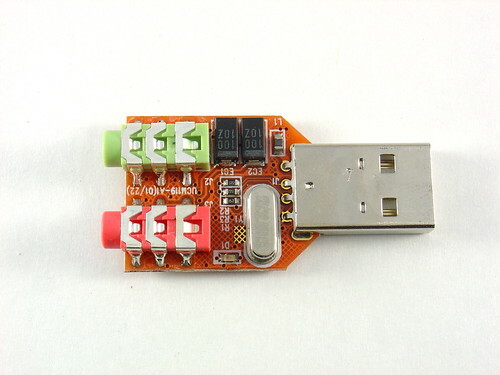 Update 2: I posted some images of the $8 USB-Audio Adapter I am using as well. Update 3: Part three is now available.